In a big departure from the hands-off approach to market regulation of the last two decades, the chairman of the Commodity Futures Trading Commission, Gary Gensler, said his agency would consider new limits on the volume of energy futures contracts that purely financial investors would be allowed to hold. The agency also announced that it would pull back part of the veil on the oil and gas markets, publishing more detailed information about the aggregate activity of hedge funds and traders who arbitrage between domestic and foreign energy prices. ….Oil prices have swung wildly in the last year, hitting about $145 a barrel last summer, then plunging to $33 in December before rising to about $70. ….A growing number of critics have blamed some of the extreme volatility on the role of purely financial investors — those who are simply betting on the direction of energy prices, as opposed to those who actually use such products, like airlines….Non-commercial traders accounted for almost a fifth of the activity in several major oil and gas products for the week that ended June 30, according to data compiled by the commodities agency. One of the interesting aspects of this is that it demonstrates the genuine difficulty in identifying asset bubbles. The housing bubble was relatively easy to spot: it took place over a long period of time and prices shot up way, way past their historical trendline. But oil? That’s harder. Take a look at the chart on the right, courtesy of Calculated Risk. 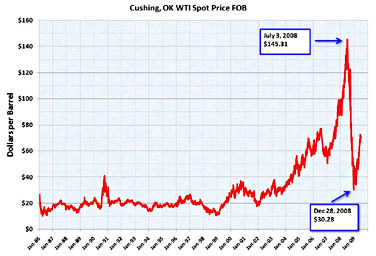 It shows oil prices over the past couple of decades, and what you see is moderate stability from 1985-1999 followed by a slow rise starting around 2000 and a sharp jump between 2004-2006. Was that a bubble? Prices dropped for a few months after that, and then, over the space of 18 months, tripled from $50 to $150. Was that a bubble? To this day, I don’t think there’s any consensus about this. Given growing demand and flat supply, prices should have gone up after 2000 — and the sharper rise in 2004 was no big surprise either. That’s not a bubble, it’s just the free market at work. But how about that second spike? Was it driven by speculation? Or was it also driven by demand fundamentals, which cratered naturally when the global economy went into recession in mid-2008? And even if it was a bubble, it only lasted 18 months. What are the odds that anybody could have identified it and targeted it fast enough to keep it under control? Beats me. But although I continue to think that supply and demand fundamentals were behind much of the price rise, I began to wobble on this during the first half of 2008. The oil market really did start to look pretty bubbly, and in August the CFTC begain to produce some persuasive evidence that financial speculators were having a substantial effect on prices. This speculative bubble couldn’t last very long (eventually speculators run out room to store their oil), but there’s good reason to think that even a 12-month spike did a lot of damage to the world economy. So what now? Oil has been on the rise recently despite the recession, causing a few analysts to suggest that speculation is once again temporarily inflating prices. And me? I don’t know. As I’ve said before, though, one thing we can count on now that demand for oil is bumping up against fundamental supply limits is lots of price volatility. Given that, trying to keep a lid on speculators creating even greater frenzy in the oil market makes a lot of sense. The CFTC is probably doing the right thing here.